Fruit pies are my summertime dessert go-to, and the Blueberry Pie version is a family favorite. If you follow me on Instagram @TheCraftingFoodie, you can catch a glimpse of my pie-making in action. My Instagram stories often show a bowl of butter and flour getting worked together into a pie crust or photos of elaborately decorated pie crusts ready for the oven. After making hundreds (yes, I literally mean hundreds) of fruit pies, I’ve learned a thing or two about fruit pies and what works for me. (Notice that I said, “what works for me”? That’s because it works for me. It’s my particular point of view – not that another point of view is right or wrong. This is just what works for me!). First, there’s an art to thickening the natural fruit juice in a pie. It’s a fine balance of getting the fruit thick enough to form a loose, juicy filling while avoiding the overly thickened, gelatinous filling that results from a heavy hand with your choice of thickening agent. 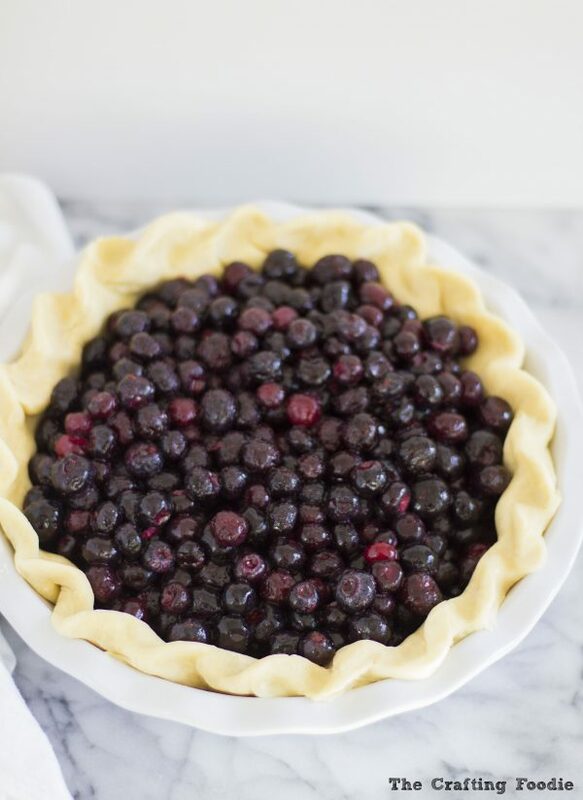 For berry pies, like this Blueberry Pie, I prefer to use cornstarch. I’ve tried arrowroot and quick cook tapioca, but I find that cornstarch gives me the most consistent result. The danger with cornstarch is that it can go wrong very quickly. A little too much can turn the filling into a gross, sticky mass. Not enough can do nothing at all to thicken the fruit juices. And the amount of thickener you use depends on how juicy your particular batch of fruit happens to be. Since the blueberries in this Blueberry Pie were so ripe and juicy, I added quite a bit of cornstarch to the filling. But if I were to use blueberries out of season when they’re less juicy and ripe, I would probably hold back on some of the cornstarch. The other important aspect of fruit pies that I’ve learned is to limit the amount of sugar you add to the filling. I think a lot of people are turned off by fruit pies because they associate the fruit filing with something sickly sweet. I can’t tell you how many people tell me they love my fruit pies because they aren’t too sweet. If you add too much sugar to a fruit filling, the natural flavor of the fruit is completely masked by the sugar. What’s the point of making a fruit pie, if you can’t even taste the fruit? And finally, the last, and possibly most important tip I have for making your fruit pies delicious every time is to add acid to your fruit pie filling. I add lemon juice, and often lemon zest, to my fruit pies, regardless of the type of fruit I’m using. The acid in the lemon juice balances the sweetness of the fruit. The lemon juice also helps to enhance and bring out the fruit’s natural flavor. I think the lemon juice in a fruit filling is what turns an average fruit pie into a spectacular one. 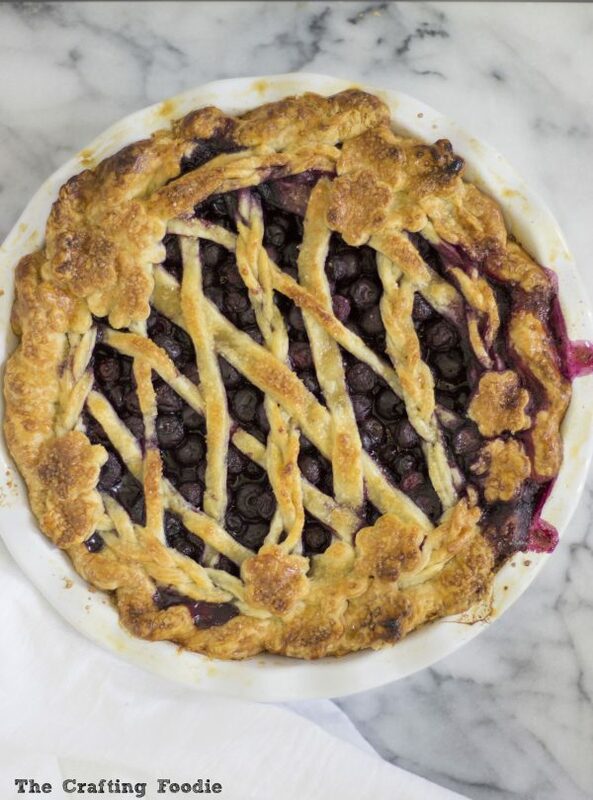 This Blueberry Pie highlights all of the tips I talked about in making a glorious fruit pie. 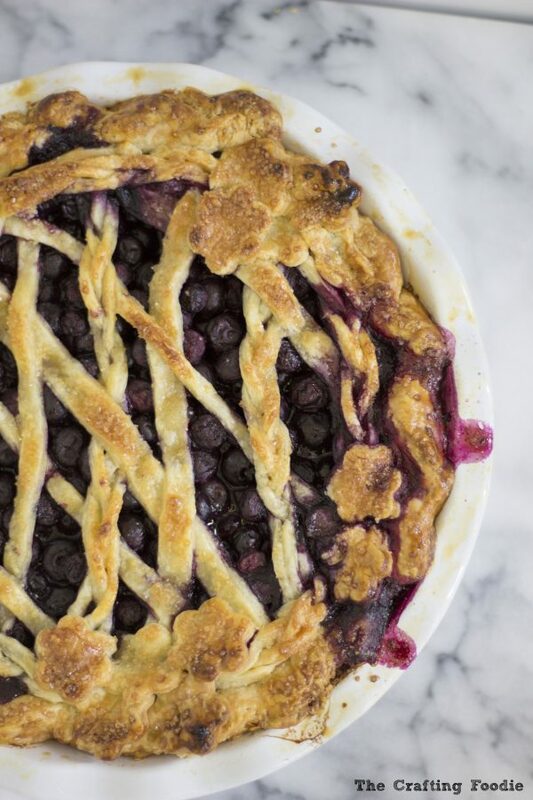 The blueberries are the star of this pie, and everything added to the filling only helps enhance the fresh, blueberry flavor. If you ever find yourself with a stockpile of fresh, ripe fruit this summer, turn it into a fruit pie. 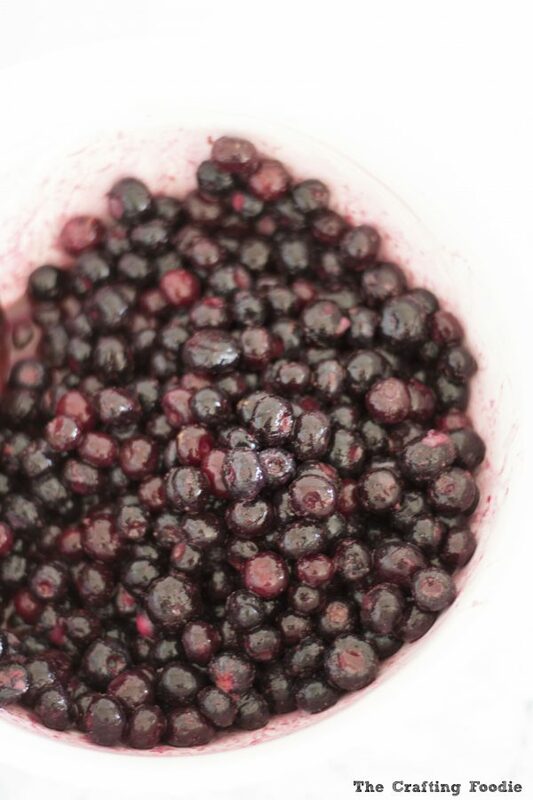 If you try some of the tips I shared along with my Blueberry Pie recipe, let me know how it turns out. I have a feeling you’re going to like what you taste. This Blueberry Pie has a crisp, flaky all-butter crust with a juicy, tart, fresh blueberry filling. In a medium bowl, combine the flour, sugar, and salt. Mix until just combined. Scatter the butter on top of the flour mixture. Using your fingers or a pastry cutter, cut the butter into the flour mixture until it resembles large, course crumbs. Sprinkle 6 tbs of ice water over the mixture. Using your hands, combined the water and flour mixture. If the dough does not come together, add 2 additional tablespoons to the minute, one at a time until the dough comes together. Separate the dough into 2 even pieces. Flatten each pice of dough into a 4-inch disk. Wrap each piece in plastic wrap. Refrigerate for at least 1 hour or put to 2 days. Add the sugar, cinnamon, nutmeg, and cornstarch. Mix until just combined. Then add the lemon zest and juice. Mix until just combined. Place a baking sheet wrapped in foil on the lowest rack in the oven. Let the pan pre-heat as the oven preheats. Take 1 pastry disk out of the refrigerator for about 15 minutes before rolling. Line your working surface with a piece of parchment paper, and lightly dust the work surface with flour. Roll your dough out so that it is slightly larger than your 9-inch pie plate. Transfer the rolled out dough to fit into your pie plate. The edges should drape over the sides of the pie plate. Place the pie plate in the reiterator. While the pie shell chills, mix the filling. Once the filling is mixed, pour it into the pie shell. Return it to the refrigerator to chill. Roll out the second disk of dough in whatever design you prefer. 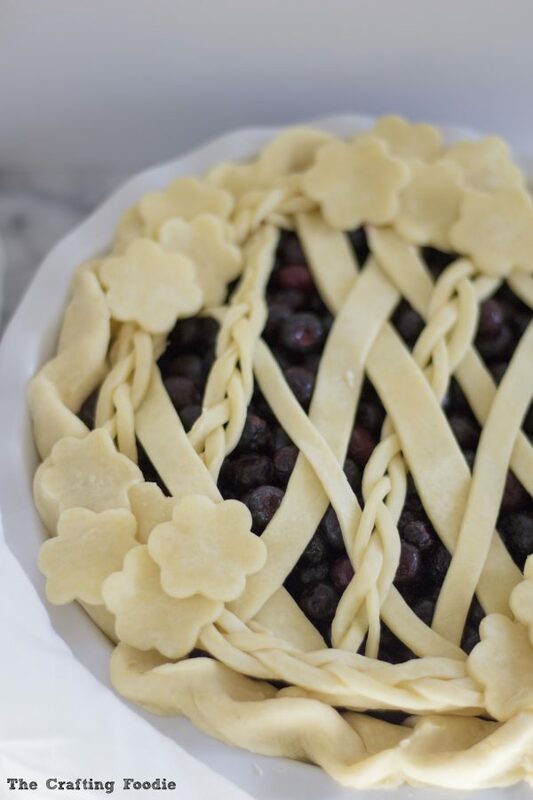 If you choose to create a lattice design, I suggest to roll the dough out about ¼ inch thick and place it in the refrigerator to chill for about 15 to 20 minutes. Once chilled, cut strips and place over the filled pie. Trim off any excess dough from the sides of the pie plate. Crimp the edges of the pie. Place the entire pie back in the freezer for about 15 min. Brush the cold pie with the egg or egg-free glaze and sprinkle with course sugar. Place the cold pie directly on the pre-heated cookie sheet. Reduce the heat to 425 degrees. Bake for about 25 minutes until the crust is a light golden brown. Reduce the temperature to 375 degrees and bake until the juices are bubbling and the crust is a deep golden brown about 35 to 45 minutes longer. 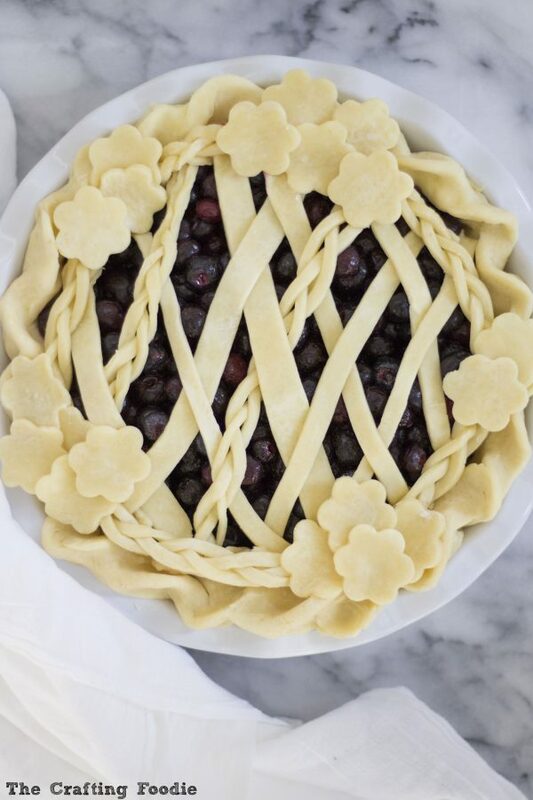 This looks so beautiful and delicious, If only I my pies would turn out this great. Need more practice. That braided crust is so sweet and pretty! Blueberries have been amazing this month..which means I might have bought more than I can chew, literally! This looks like a good way to make sure they don’t go to waste. Yum! That looks amazing! I need to try making some soon! Thanks, Belle! Fruit pies are a great way to use up beautiful ripe fruit you may have lying around this summer! Wow, this looks amazing! Both in flavor and design. My boys love blueberries, I bet they would go crazy for something like this. Thanks for sharing!! Thanks, Stephanie! My girls love berries (and fruit in general), and they love this pie. I hope you give it a try! This turned out beautiful. Thanks for the tips! Thanks, Roxsanne! After making tons of pies, I’ve started to opt for more intricate crust designs. It’s always nice to change it up! What an absolutely gorgeous pie! I love the lattice work that you did. So intricate and beautiful! Thanks so much Sharon! 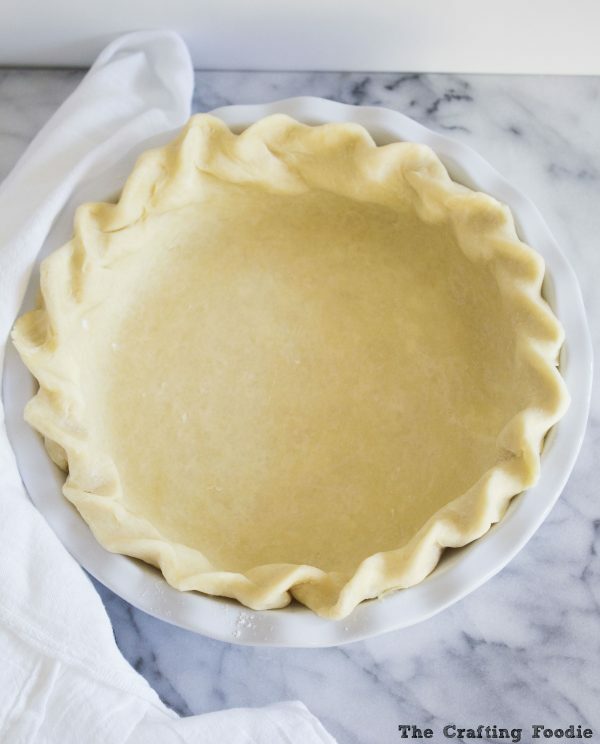 Pie crust is one of those things – it doesn’t matter what it looks like, it always tastes amazing! 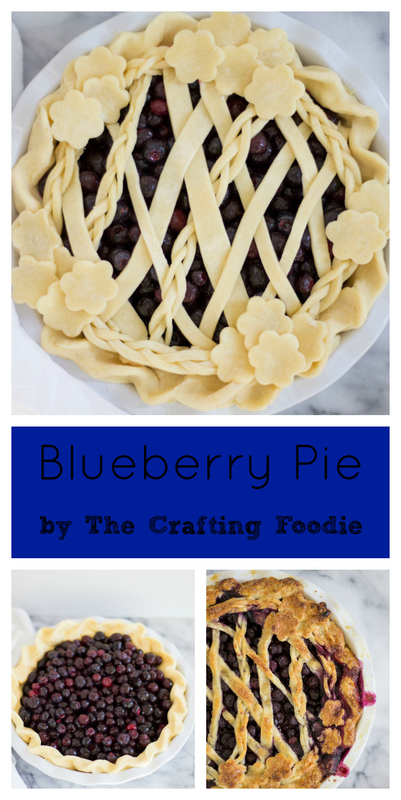 I love blueberries when they are baked, especially when they are baked in pie crust! Your crust is gorgeous! Thanks so much, Lauren! My daughter love’s pie crust so much that I often bake the crust in shapes just like sugar cookies. They’re her favorite! Omg blueberry pie is the absolute best!! So yummy! do use one of those bird that let the steam out if you cover the pie entirely ? I’ve actually never used one of those birds. They’re super cute – but I opt for the low tech option by cutting vents in a crust!